Founded over 20 years ago, Out of Eden Ltd, based in the rural market town of Kirkby Stephen, is a family owned business, supplying to the hospitality industry. The Out of Eden Fund was set up in 2016 and is integral to the business, linking to employee volunteering and supporting local projects. The money is invested and any income generated is given out in grants via the Foundation Grants Fund, where donations are pooled together to grow the unrestricted fund and respond to the growing needs of local communities. In 2015, Shap Community CIO took over management of The Old Courthouse from Cumbria County Council. 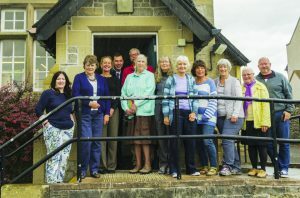 The building is at the heart of the community and is run by volunteers. Groups use the centre to meet up and do crafts, make music, read poetry or just to have a chat, and it is regularly used by the local playgroup and the health visitor clinic. Funding from the Foundation Grants Fund was used to improve the building and create a bright and welcoming social area. As the Eden Valley’s largest employer, Out of Eden is fiercely proud of both its family run Cumbrian roots and its commitment to upholding ethical and environmentally sound values and has received the Cumbria Business Environment Network (CBEN) Gold Award every year since 2012. The business also considers local impacts and global consequences, and supports Brathay Trust in Ambleside and a project in Ethiopia, alongside World Vision.